The multi-scanner stud finder is an extremely ideal tool for construction, electricians, masons, carpenters, homeowners, and others who need reliable detection. The stud finder wall scanner has four scanning modes in total : Stud Scan, Deep Mode, Metal Scan and AC Scan, which offers you wide choices to select your desired mode when it comes to various tasks. Due to the multi-mode detection and portability, the users can apply the stud finder wall detector to wide use. You can work on different wall surfaces, such as lath, wallpaper, wood flooring, acoustic ceiling, painted walls and more. 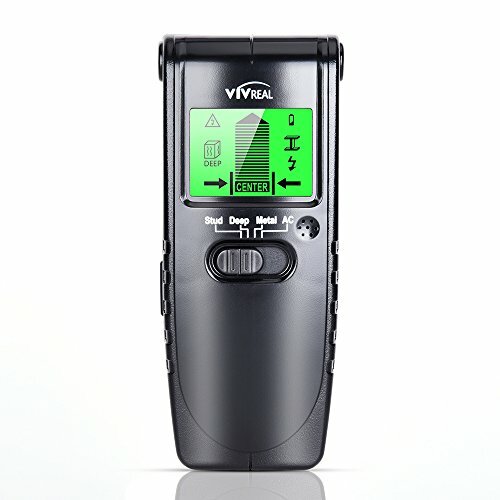 The greatest advantage of VIVREAL multi-scanner stud finder lies in its fast and simple detection. After selecting your desired mode, simply press the button on the left side of stud finder wall detector, you can quickly and accurately identify the wood and metal studs, copper and steel pipe, rebar, or wiring hidden behind the walls. It really saves you quantities of time and makes your detection experience more interesting and productive. In addition, VIVREAL wall scanner detector also gives you many audible and visible cues when any objects detected, which helps you to find the exact location of variety of materials. The bright graphical LED display shows the Read-Outs of detection mode, signal strength, automatic calibration, battery indication with maximum readability. These smart features all make the stud finder wall scanner compact and durable. 1. Hold the stud finder properly and move it slowly in one direction to obtain the optimum scanning results. 3. Make sure that the surfaces you scan are flat and have been fully dried out. 4. Take care when working near the electrical wires and always turn off the power supply.